“Resident Evil 7: Biohazard” is the latest video game in the long existing “Resident Evil” franchise. The player plays as Ethan Winters, a grieving man looking for his lost wife, Mia. After her three-year disappearance, Ethan is sent a video tape by Mia and ventures out to find her. He travels to Dulvey, Mo. and arrives at a broken-down plantation. Once in the house, Ethan finds his wife, who has been mutated into a demonic super human. After a brief battle between the couple, Ethan is knocked out and dragged to the main house by an unknown assailant. The game’s genuine creation of fear and tension is what resides with the player. They never know what mutated monster will be lurking around the corner, waiting to strike. Many horror games aim straight for jump scares and make an unimpressionable mark on players. Director Koshi Nakanishi used three main factors for his mysterious gameplay. First, he integrated each member of the protagonist’s family as a boss opponent. Each family member has their own house that the player must venture through, solve puzzles, and finish the objective. For example, in the main house, the player fights Jack Daddy, the father of the infected family. The main objective in his area is to find three puzzles pieces and open the main door. Next, Nakanishi’s brilliant choice in music not only heightens emotions during gameplay, but creates a sense of confusion. Sometimes when running through any of the infected houses, terrifying music is played. A player’s first thought is either jump scare or cut scene, and sometimes they are right. In the case of “Resident Evil,” freighting music is added just to raise tension and make the player second guess their safety. The third aspect that the developers added was the humane aspect to each infected character. Even though they are trying to murder the player, the infected family still looks human. 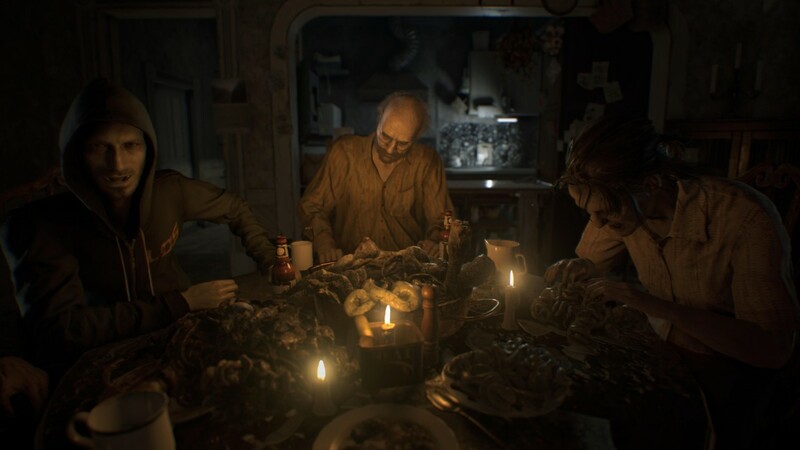 The developers also scatter the family’s memorabilia around the house, allowing for players to interact and imagine a life for the blood thirsty family before they were infected. Most “Resident Evil” games have a few main characters such as Chris Redfield and Leon Kennedy. The seventh installment had none of the main characters except a sprinkle of Chris Redfield at the very last cut scene. The game listened as many people were displeased that no main characters were integrated in the gameplay, and that we could not fight Lucas, one of the infected family members. Game developers listened and released a new and free DLC called “Not a Hero,” where gamers play as Chris Redfield hunting down Lucas in a nearby abandoned salt mine.